I've loved the idea of owning an Alfa GTV for...I dunno...as long as I can remember driving or riding in cars. Fortunately, or unfortunately, they have been affordable over the years and I've not pulled the trigger, probably because I assumed they would always be affordable. Unfortunately, or fortunately, recent market activity has brought considerable price inflation to the price of most classic cars, particularly handsome Italian models, so if you want a GTV, you might need to settle for something with a gash or two on the side. 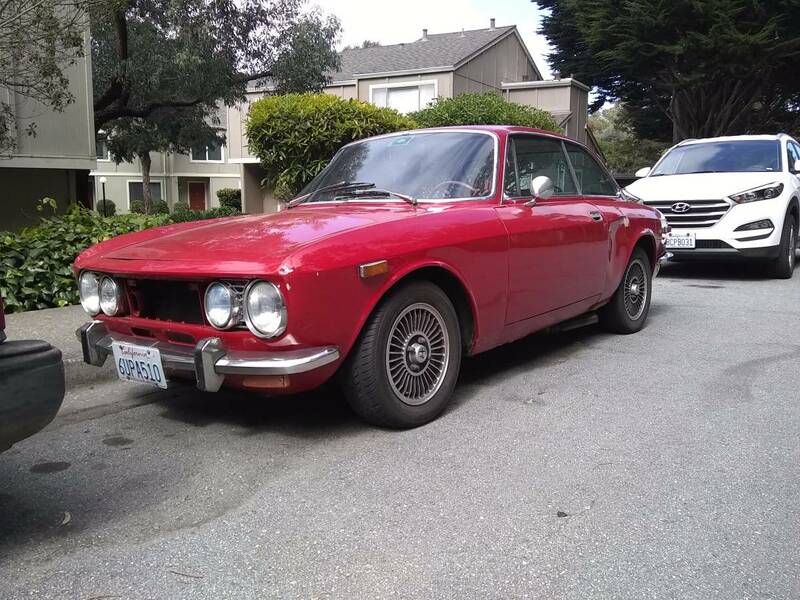 Find this 1974 Alfa Romeo GTV 2000 offered for $15,000 in El Cerrito, CA via craigslist. Tip from Erik202. This is my jewel, it has low mileage, runs good. I have had it for 28 years. Moving overseas and it costs too much to ship it. Almost no info or pics..? I want one of these something fierce. It just seems to me that every car nut needs to have one of these pass through their lives at some point. I'm with you on this, one of the most beautiful cars ever made. Unfortunately so far GTVs have gotten too pricey for my budget the last couple of years. Very excited for italian week! I almost grabbed a stepnose project recently that was priced similar to the one featured above, it was mid "resto" with the interior sitting next to it and rockers cut out but ultimately decided it was not something I had the space to work on. I'm sure I'll be kicking myself when i see it completed and driving around my city in a couple years. If this guy has had it for 28 years, maybe he knows why it looks like there is some sort of repair involving body filler between the driver's door and the rear wheel arch, that got banged again chipping off said body filler , and on top of that ( below actually ) there is one of those big sheet metal dimples that I always associate with the distance between the front of the car and the back of the car being an inch or so less than it ought to be. Or maybe it's just some sort of parking lot mayhem that is exposing old repairs, but still some sort of mention of what happened when would make the whole thing more enticing. 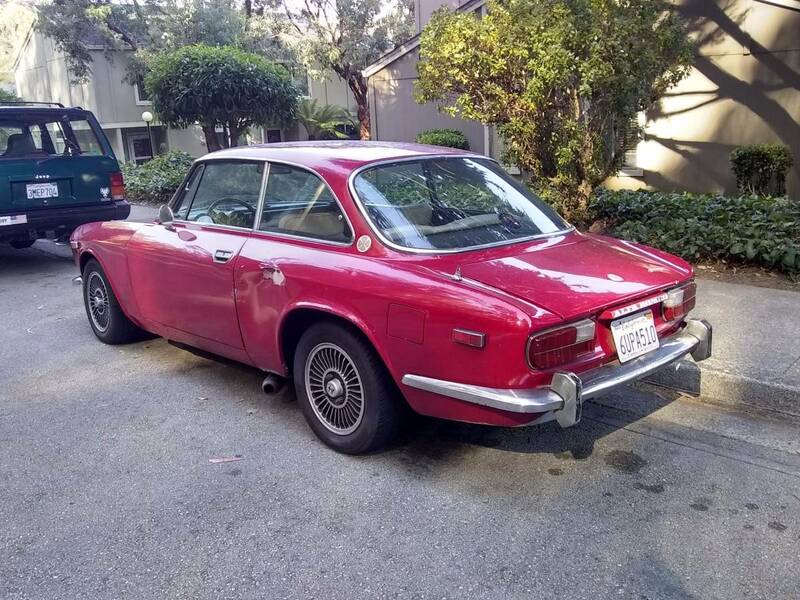 And I know it's craigslist and the poor guy wasn't asking for the international attention of this fine institution, but for 15K does it even have an interior or engine ? So much car, so little information. Lovely cars that have been on my "want" list since I was 17 (and that is a LONG time ago....). If I was close, I certainly would check it out. I don't know how the owner drove this with out the front Alfa triangle. It would be so important for me to own this. Also I would need gta steel wheels. Like the car though! Kind of agree with Hugh. Wonder why the exhaust comes out in front of the rear wheel. Not "jewel" like in my world.